In the UK, green, white and purple were the colours of the Women's Social and Political Union, led by Emmeline Pankhurst, just one of several organisations involved in the suffrage movement, but perhaps the most militant. The suffragette banners that are part of the Fawcett Library collection (http://www.thewomenslibrary.ac.uk although there are none shown currently on the website) in London Metropolitan University show a variety of colours and symbols. The Women's Freedom league had a banner in green, yellow and white; the Married Women's Association has one in green and white; that of the National Union of Societies for Equal Citizenship is green, red and white; one of the banners of the National Union of Women's Suffrage Societies is green, gold and white, but another is red and green. Many banners commemorated famous women, and bore suitable colours and symbolism according to whoever was being commemorated. In "100 Years of Women's Banners" there are a lot of women's flags and banners, including a note on the colours of suffragists (green and white and scarlet) and suffragettes (green and purple and white). On an episode of the Antiques Roadshow, a woman brought some memorabilia relating to the suffragettes. One of these was a colour picture showing a woman holding a flag wrapped around a pole. While the orientation of the flag is unclear, it is clearly divided green-white-purple. It might be horizontally divided (as shown at top of page) but another item that was brought was a medal issued by the organisation given to women who participated in a hunger strike, the ribbon of which was divided vertically green-white purple. I think that the Suffragettes' flag was derived via the Suffragists from the Chartists who had a purple, white and green triband and who often displayed plain purple flags as symbols of the sovereignty of the people, but the Suffragettes flags had the colour order reversed as Green, White, Violet standing for Give Women Votes. Given the direct militant action of Suffragettes there may have been an intended reference to Napoleon - 'Corporal Violet' was remembered by carrying violets, and the violet hybrid pansies were associated with Free-Thought and radical causes as a pun in French on pensee. 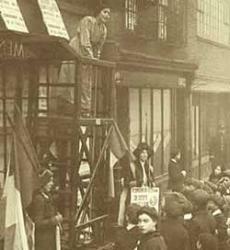 The colours are well known but the flags are not because small personal items like ribbons and sashes were kept and these look like tribands, but there are a number of photographs, e.g., of Sylvia Pankhurst standing on a sort of scaffold to address a meeting flanked by women each holding tricolour versions of the flag, and of a horse-drawn bus in London in 1910 decorated with tricolours so the WSPU was definitely invoking the French tricolour's associations. (For such photographs look in the popular history book The Ascent of Woman by Melanie Phillips ISBN 0 316 72533 1). A "W.S.P.U." flagoid can be seen here, a long green lance pennant with fancy letters: http://2.bp.blogspot.com/_knHmw4EPfhE/SyMmPWRXKUI/AAAAAAAABSI/CN0yqPUksis/s1600-h/SuffShopOnePennyNewspaper1912.jpg and the already known lapel pin with horizontal stripes and slogan: http://3.bp.blogspot.com/_knHmw4EPfhE/SyMt1JdN6pI/AAAAAAAABSo/WWqlf0-iZyE/s1600-h/SuffShopBadgeFlag.jpg. See context at http://melbourneblogger.blogspot.com/2009/12/suffragette-shops-ideal-business.html. The WSPU tricolour was designed by Emmeline Pethick-Lawrence ? One of the placards stated that it was Emmeline Pethick-Lawrence who devised the ' Give-Women-Votes ' Green-White-Violet WSPU tricolour, but I have not been able to find any other confirmation of this. I thought that these were originally Joseph Sturge's Complete Suffragist Union triband colours placed vertically ( the mid 19c rival organisation of the National Charter Association.) Perhaps with these tip offs somebody can look for some historical references ? This WSPU flag is of course upside down - but this is a nice story: they also dyed the Bradford reservoirs' waters violet.
" ... The suffragette movement in Britain had become more militant in their activities in 1912, following the rejection of a bill that would have given women limited rights to the vote, originally supported by then Prime Minister Asquith. Bradford suffragettes were very active and earlier in 1913 had dug up the 2nd and 12th green at Bradford Moor Golf Club, replacing the flags with the purple, green and white flag of the Women's Social and Political Union. ... "